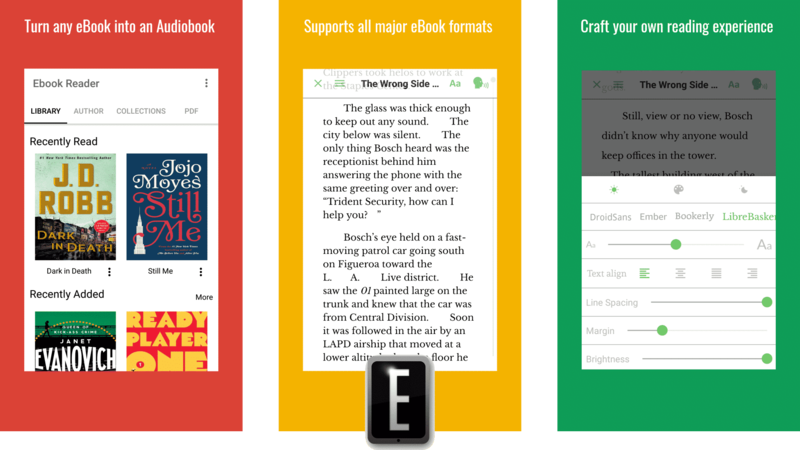 Good e-Reader would like to introduce our first major Android app for smartphones and tablets. It is called Audio Reader and it turns any ebook into an audiobook. It reads aloud all of your sideloaded content using Amazon Polly, which is what Alexa is built on. We support 28 different languages and 12 different voices for English users. There are a few professional features if you enjoy using the app on a regular basis or want to give us your support. You can remove all of the ads and unlock cloud sync and Google Drive support. This app took over six months to develop and looks really good. It has a flat design and looks sexier than most of the other e-reader apps on Google Play. If you don’t feel like having your books read aloud, no worries! We have a really advanced engine that is similar to the Kindle or Nook, you can change the background color, text size, font type, line spacing and margins. Good e-Reader has been following the rise of the e-reader and ebook industry since 2007 and has given us a unique perspective. We have been bullish on Audiobooks since 2014 when Michael Kozlowski wrote a series of yearly reports. Good e-Reader knows audiobooks and ebooks really well, this app is our love letter. Download our free app today from Google Play and the Good e-Reader App Store. I appreciate your development of this app; however, it has crashed on every Android device I have. Particularly it would be nice to install it on the 7″ Fire Tablet to make it more accessible. Currently I use PocketBook, MoonReader+ (sideloaded,) Kindle TTS and Alexa when possible, so I’m curious to try your reader. Please let me know if there are known issues or if there’s anything else I can try. Thanks! what android devices do you have and what version of android are you using? The App needs Google Play Services right now, so it would likely be incompatible with the Fire, although we are working on a port right now for fire devices. Thank you. I had Google Play on the Fire Tablets and could reinstall, but I am trying to set up tablets with TTS solutions that work out of the box. Thank you for all of your work on this! Is this on Apple products also? No yet, we are launching on Android first. Once we can recoup our development costs, we can do a iOS version. We’re working on some bugs right now! Yeah, for English is like 4-5 voices for US, once you find the one you like, stick with it. There are plenty of ways to download ebooks online. happy it is working for you! With the book I loaded, I wasn’t able to jump forward. Listening to the books table-of-contents, etc. wasn’t fun. Also, when I opened another app, the story stopped (just like Youtube’s videos). Not useful if you want to turn off the screen. We are talking about implementing a feature where you can listen if the app is minimized, screen is turned off or the phone is sleeping. The best way to enable text to speech is to scroll down to the first chapter then hit TTS. TTS will not jump to chapter one. so i recommend scrolling or in the TOC going to chapter one. We just added support for most tablets, and confirmed its working on a few seven inches we tested, it might even work on your Fire now! This is a nice app, once a solid book mark feature is added and I can run the Read Aloud Option in the background with the phone in locked mode then i will buy it.